(born 4 June 1959) is an Indian business magnate. He is the chairman of Reliance Group (also referred to Reliance ADA Group) which came into existence in June 2005 following a demerger from Reliance Industries Limited. He leads a large number of stock listed corporations including Reliance Capital, Reliance Infrastructure, Reliance Power and Reliance Communications. Ambani's net worth was $2.3 billion according to the Forbes billionaire list in the year of 2018. 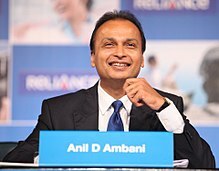 Anil Ambani was born on June 4, 1959 in Mumbai, Maharashtra, India to Dhirajlal Hirachand "Dhirubhai" Ambani, the founding father of Reliance Industries, and his wife Kokilaben Ambani. He is the younger brother of Mukesh Ambani, who later became the head of Reliance Industries Limited, and has two sisters, Nina Kothari and Deepti Salgaonkar. His father settled in Mumbai following his return from Yemen and started his import-export business in a small 350 sq. ft. room in partnership with his cousin Champaklal Damani. He and his partner went their separate ways in 1965 and he founded Reliance Industries in 1966. Anil grew up in a typical middle-class Indian family and lived in a two-bedroom apartment at the Jai Hind Estate in Bhuleshwar, Mumbai, in the early 1970s. The family lived in a six-storeyed apartment at Usha Kiran for some time and later his father purchased a 14-floor apartment in Colaba, where the two brothers lived for a long time. In 1975, he enrolled into Kishinchand Chellaram College under University of Mumbai, from where he earned his bachelor's degree in Science. He later went to the USA to pursue his master's degree in Business Administration at The Wharton School, University of Pennsylvania. Anil Ambani joined his father's conglomerate company, Reliance Industries, as the Co-Chief Executive Officer in 1983. In this position, he has been credited with pioneering many innovations in the Indian capital market. He also led India's first foray into overseas capital markets with international public offerings of global depositary receipts, convertibles and bonds. Since 1991, the company, under his leadership, has managed to raise around US$2 billion from overseas financial markets. The high point in his overseas endeavours came in 1997 when he launched a 100-year $100 million Yankee bond at a rate of 10-25 per cent per annum in the US market. Following in his father's footsteps, who had made issuing of such bonds fashionable, his attempts made the company the first in India, and the country the second in Asia, to issue these bonds. Since 1986, after their father suffered a stroke, the two brothers successfully took the company to new heights, making it one of India's leading textiles, petroleum, petrochemicals, power and telecommunication company. After Dhirubhai Ambani died of a major stroke on July 6, 2002, the two brothers started to have differences over 'ownership issues'. By 2004, the split between the two had become evident and both of them trusted their mother, Kokilaben Ambani, with the task of dividing the Rs. 90,000-crore Reliance empire between her two sons. Following the demerger the next year, Anil formed the Reliance Anil Dhirubhai Ambani Group (Reliance ADA Group). He has been heading Reliance Infrastructure Ltd. since 2003, and became the Chairman of Reliance Capital Ltd. in 2005, Reliance Communications Ltd. in 2006, and Reliance Power Ltd. in 2007. In 2008, he was credited with India’s largest IPO of Reliance Power which was subscribed in less than 60 second on offer, the fastest in the history of Indian capital markets. In 2005, he ventured into the entertainment industry by acquiring a majority stake in Adlabs Films, a company involved in film processing, production, exhibition and digital cinema. The company was renamed to Reliance MediaWorks in 2009. Reliance Entertainment, media and entertainment arm of his company, emerged on the global platform in 2008 after starting a joint venture worth US$1.2 billion with Steven Spielberg's production company DreamWorks. The company had significant contribution to the production of Spielberg's 'Academy Award' winning 2012 biopic 'Lincoln'. Anil Ambani's Reliance Group has a market capitalization of US$14 billion and net assets of US$28 billion. Operating in over 20,000 towns and 450,000 villages in India and abroad, the company touches the life of 1 in 10 Indians every single day. In December 1997, India's leading business magazine 'Business India' named Anil Ambani the 'Businessman of the Year'. He was conferred 'The Entrepreneur of the Decade Award' by the Bombay Management Association in October 2002. In 2004, he was named 'the CEO of the Year' in the Platts Global Energy Awards. 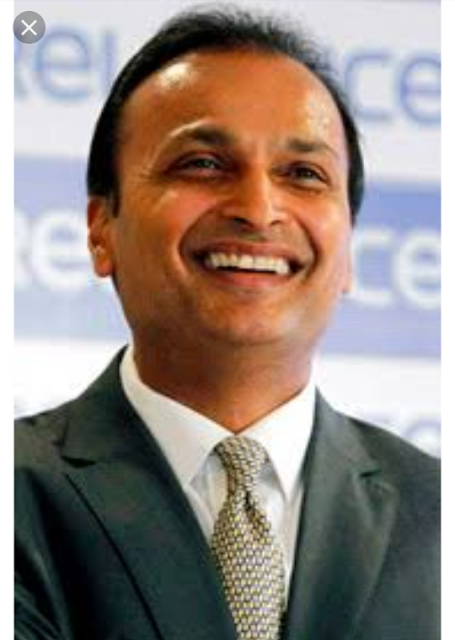 Anil Ambani was voted the 'Businessman of the Year' in a poll by 'The Times of India', in 2006. Anil Ambani met his future wife, yesteryear's Bollywood actress Tina Munim, while attending a Gujarati wedding in the 1980s. They met again within a few months while both of them were in Philadelphia, but when he asked her out she declined as she was in a relationship with much older Bollywood superstar Rajesh Khanna. In 1986, while nursing a broken heart after being separated from Rajesh Khanna, Tina learned about Anil's interest in her via a relative. While initially reluctant to get into another relationship, she later agreed to go on a date and the two became emotionally involved soon after. Despite the fact that she was also a Gujarati like them, Anil's family was against the union due to her previous involvement. This caused them to part ways for years till he once again contacted her after his parents, realizing his genuine love for the actress, gave consent to their marriage. The two finally got married in February 1991 in a lavish Gujarati wedding ceremony. They have two sons together, Anmol and Anshul, born in 1991 and 1995 respectively. In 1975, during his interview to get into KC College, everyone spoke to Anil Ambani in Sindhi, mistaking his surname, which ends in 'ni', to be a Sindhi surname. However, both his parents are Gujarati, and he stated in an interview that he is proud to be a Gujarati. As a child, he was a prankster and often got into troubles for the pranks he played on others, while his mother, who had a soft spot for him, had to come to his rescue. According to some sources, once when asked by his father how he broke a glass, he reportedly broke another glass to demonstrate, which, instead of infuriating his father, gave him a good laugh. 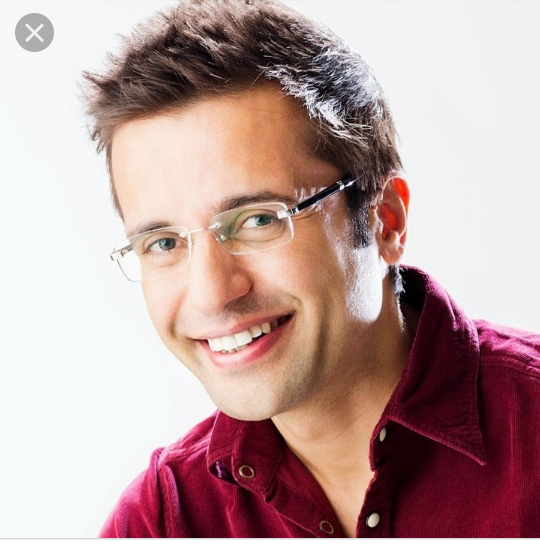 His major business interests in entertainment includes 44 FM radio stations, nationwide DTH business, animation studios, and several multiplex cinemas throughout India. He is married to former Bollywood actress, Tina Munim and has two sons Anmol and Anshul. After the death of his father in 2002, Anil Ambani took over the reins of Reliance Group with interests in Telecom, Entertainment, Financial Services, Power and Infrastructure. In 2008, Ambani is also credited with India's largest IPO of Reliance Power which was subscribed in less than 60-second on offer, fastest in the history of Indian capital markets till date. Ambani made his debut into the entertainment industry with an acquisition of a majority stake in Adlabs Films in 2005, a company with interests in film processing, production, exhibition and digital cinema, the company was later renamed Reliance MediaWorks in 2009. In 2008 a joint venture worth US$1.2 billion with Steven Spielberg's production company DreamWorks cast Ambani's entertainment business on to a global platform. Through this link he has contributed to the production of a number of films with Steven Spielberg, including the Academy Award winning film Lincoln in 2012. He has earned a Master in Business Administration at the Wharton School of the University of Pennsylvania where he graduated in 1983. Anil Ambani is a Gujarati. He is married to Indian actress Tina Munim. They have two children. Voted 'the Businessman of the Year' in a poll conducted by The Times of India – TNS, December 2006. Voted the 'Best role model' among business leaders in the biannual Mood of the Nation poll conducted by India Today magazine, August 2006. Conferred 'the CEO of the Year 2004' in the Platts Global Energy Awards. Conferred 'The Entrepreneur of the Decade Award' by the Bombay Management Association, October 2002. Awarded the First Wharton Indian Alumni Award by the Wharton India Economic Forum (WIEF) in recognition of his contribution to the establishment of Reliance as a global leader in many of its business areas, December 2001. Selected by Asiaweek magazine for its list of 'Leaders of the Millennium in Business and Finance' and was introduced as the only 'new hero' in Business and Finance from India, June 1999. In 2018, India's principal opposition party INC accused the Prime Minister Narendra Modi of favouring Anil Ambani's defence manufacturing company over HAL, a public sector enterprise, in a fighter aircraft deal worth INR 58,000 crores with French manufacturing firm Dassault. Ambani, several of whose companies are debt-ridden, has denied all charges of benefiting from crony capitalism. In a possibly related controversy, it also came to light that one of Anil Ambani's firms had partly financed a French film where former French president Francois Hollande's then partner had acted in, around the same time the aircraft deal was being negotiated..
US$43.6 billion (2016) "'" (PDF). Reliance group was founded by Dhirubhai Ambani in 1966 as a polyester firm. Reliance later entered into financial services, petroleum refining, power sector. By 2002 Reliance had grown into a U$15 billion conglomerate. After the death of Dhirubhai Ambani on 6 July 2002, Reliance was headed by his sons. The group was formed after the two brothers Mukesh Ambani and Anil Ambani, split Reliance Industries. Anil Ambani got the responsibility of Reliance Infocomm, Reliance Energy, Reliance Capital and RNRL. Reliance Group entered the power sector through Reliance Power, and the entertainment sector by acquiring Adlabs. In October 2010, Reliance power placed world's largest order worth $8.29 billion to Shanghai Electric Group to supply power equipment based on Supercritical steam generator technology. Reliance power was the first Indian company to earn carbon credits, and the United Nations registered Reliance Power’s Sasan power project is planned to earn as many as 22.5 million credits in the next 10 years, under the UN Clean Development Mechanism, a greenhouse gas market which issues tradable credits to emissions-lowering projects in developing countries. Reliance Power has coal mines in Indonesia, and has also made major acquisitions in UK and USA. On 28 October 2017, the group launched construction of a defense production unit in Mihan-SEZ region. The unit will be part of a joint venture between Reliance Group, led by Anil Ambani, and its JV partner French major Dassault Aviation. The production at Mihan-SEZ will begin with components for the Rafale warplanes and Falcon business jet produced by Dassault. It is expected to fully assemble both the aircraft in the Nagpur unit in the coming years. The brand ambassador of Reliance is Anushka Sharma for Reliance Communication, Abhishek Bachchan and Sonu Nigam for Big 92.7 FM. Virender Sehwag was formerly the brand ambassador for Reliance Communication, then known as Reliance Infocom.